Louisville, KY - Hillary for Kentucky announced its Kentucky Women for Hillary team – a group of civic, business, and community leaders endorsing and supporting Hillary Clinton’s candidacy. Kentucky Women for Hillary members will participate in our campaign as volunteers, community event hosts, and more. · After graduating from Yale Law School, Hillary did not go to work for a prestigious law firm. Instead, she became an advocate for women, families, and children. She went to work at the Children’s Defense Fund, where she helped expand access to education for children with disabilities. · As first lady of Arkansas, she helped start Arkansas Advocates for Children and Families. · As first lady of the United States, Hillary was a staunch advocate for women and children’s issues. She led the U.S. delegation to the U.N. Fourth World Conference on Women in Beijing, where she proclaimed that “women’s rights are human rights.” She also advocated for the Family and Medical Leave Act, which provides leave for new parents or those with a sick loved one, and she worked to increase funding for child care. 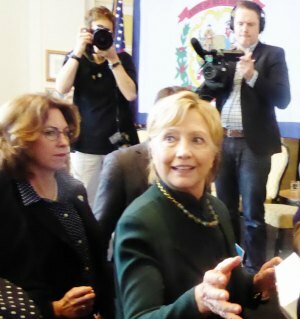 · As senator from New York, Hillary championed access to emergency contraception and voted in favor of strengthening a woman’s right to make her own health care decisions. She also championed the Paycheck Fairness Act and co-sponsored the Lilly Ledbetter Fair Pay Act in an effort to achieve equal pay and help close the wage gap. · As secretary of state, Hillary made women’s rights a cornerstone of U.S. foreign policy. She created the now-permanent position of ambassador-at-large for global women’s issues and helped launch the first U.S. strategy on women, peace, and security. She also advanced women’s economic empowerment, championed programs to prevent and respond to gender-based violence, and spearheaded public-private partnerships to improve the status of women and girls.